Formuleblad Very handy formula sheet / summary of the course statistics for Premaster of the pre-master Strategic Management / Supply Chain Management / Marketing Management etc. Per week all formulas etc. are summed up with some additional explanations. The author has completed the course with a 9 ! DATA-ANALYSE STAPPENPLAN VAN ALLE FORMULES Step-by-step plan for all data analysis formulas. Summary of Statistical methods for Business and Economics (Chapter 5-19, chapter 18 excluded) Summary of the book Statistical methods for Business and Economics (Gert Nieuwenhuis) chapter 5-19 and lecture slides for the course \\\\\\\'\\\\\\\'Statistics for premaster\\\\\\\'\\\\\\\' (2017). Includes explanations in both English and Dutch. Excluded: 10.2 12.3 Chebyshev Hypergeometric distribution (part of chapter 9) Conditional distributions and Poisson-distributions (part of chapter 11) Chapter 18 Everything is included needed for the midterm Statistics for premaster. FORMULAS FOR Statistics (statistical methods for business and economics) All the formulas you need to pass your premaster statistics! Team Assignment Statistiek 2018/2019 - 9.5 This document contains the report for the Team Assignment of the course 'Statistiek voor Pre-master'. In addition, the general description of the assignment is included in the document. The report is in English and the description of the assignment in Dutch. The report will give you guidance to write your own report for this course. This report was graded with a 9.5. 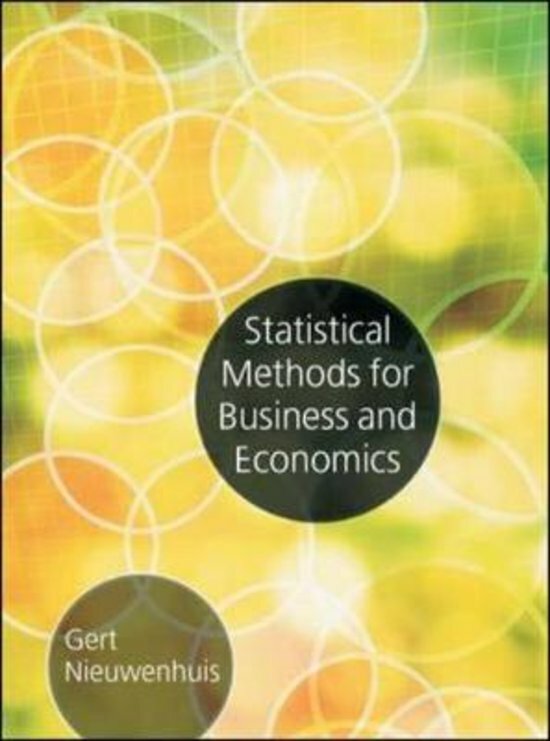 On this page you find summaries, notes, study guides and many more for the study book Statistical Methods for Business and Economics, written by Gert Nieuwenhuis. The summaries are written by students themselves, which gives you the best possible insight into what is important to study about this book. Subjects like Statistiek, Statistics, Gert Nieuwenhuis, premaster, Statistical Methods for Business and Economics, Tilburg University, Statistics 2 & Statistiek 2 will be dealt with.